The myth of Pygmalion permeates a good portion of Hollywood stories. The myth which tells the story of the sculptor Pygmalion, who uninterested in other women, creates the perfect woman out of ivory. After falling deeply in love with his creation, he begs Venus to bring his creation to life, and is granted his wish. This story or versions of it have appeared all across pop culture and include My Fair Lady, Weird Science, Mannequin, She’s All That, Pinocchio (to a lesser extent), and now Ruby Sparks. Ruby Sparks closely resembles the Pygmalion myth, but instead of a sculptor this modern day Pygmalion, Calvin (Paul Dano), is an author who found fame at an early age. Calvin’s first novel published when he was 19 was a critical and commercial success, and is considered a great modern American novel alongside novels like Catcher in the Rye. 10 years later, despite his fame, Calvin cannot find a new subject for his next novel. He becomes wary of all who would label him “genius”, and withdraws socially from the world. When his psychiatrist urges him to write about a dream, he finds sudden inspiration in the beauty of his creation, Ruby Sparks (Zoe Kazan). Suddenly, Calvin can do nothing but write day and night, and pours himself into his creation. He falls in love with his creation, and writes to spend more time with her. When Calvin awakes one morning and Ruby is there, he has to deal with his perfect creation. The film which starts out as a quirky comedy, deftly moves into introspective drama throughout the later portions of the film. Much of the beginning is cute, lighthearted, and bright. While the last third of the film is dark, introspective, somewhat depressing, but extremely insightful of the characters inhabited within. It’s few stumbles come in the second act in which Calvin continues to try to tweak his creation. The scenes aren’t as sharp as the acts that bookends it. Paul Dano and Zoe Kazan, who date in real life, show real chemistry in this film. It’s even more impressive when you find that Kazan herself wrote the script, and most likely had herself and her boyfriend in mind for the roles all along. Kazan’s Ruby Sparks is bound to be another iconic “manic pixie dream girl” type that do so well on screen. Her quirks are cute, her style unique, and at first is totally unbelievable. The beauty of the film is watching the creation become a much more textured character, and surpassing that of her own creator. Dano shines as the socially phobic writer who struggles to keep dominance over the character he loves and created. Back in their first film since Little Miss Sunshine, Jonathan Dayton and Valerie Faris, may not have crafted a film as easily accessible as their previous film, but have proved the two have talent in molding actors performances into something special. Not only do they get their leads natural chemistry to flow well on screen, but shift it over to the supporting cast as well. Standout among the supporting cast is Chris Messina who plays Calvin’s less brilliant, but socially adept older brother, Harry. 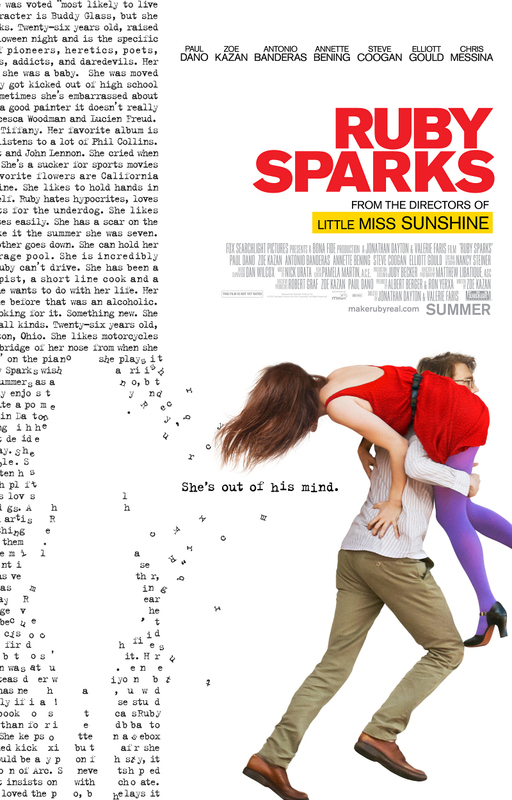 Ruby Sparks is recommended for those looking for a sharply written, fantastically filmed, indie rom com. The crowd who enjoyed things like Garden State, Away We Go, and (500) Days of Summer will fine a lot to appreciate here.